ShowLED Animation Waterproof: Weatherproof LEDs for outdoor use. Let your imagination run wild. Cover office buildings, add dynamic effects to printed banners, embrace your architecture with LED lighting. Advertising, art, lifestyle; with our waterproof LEDs there is no limit to what you can do. The request for outdoor LED applications with video control options, for fixed but mainly for temporary installs, led to another ShowLED inhouse development of LED strings, cabling and connectors. ShowLED Animation Waterproof is a custom designed and developed chain of components to fulfill the requirement of a water, wind, dust and UV proof solution. The waterproof system is fully compatible with the existing ShowLED Animation controllers and software, the ease of use and flexibility is not only maintained, but upgraded to another level. The IP 65-rated version of the Animation LED strings, in combination with a rugged high tech netting, is ready to resist the most severe weather conditions (rain, snow and burning sun). UV proof cabling and moulded connectors offer a system conform the EN 60529:1991 + A1:2000 standards. When integrated in other outdoor fabrics or a durable netting, the Waterproof Animation system introduces previously unheard of flexibility and capabilities for outdoor LED and Video entertainment. 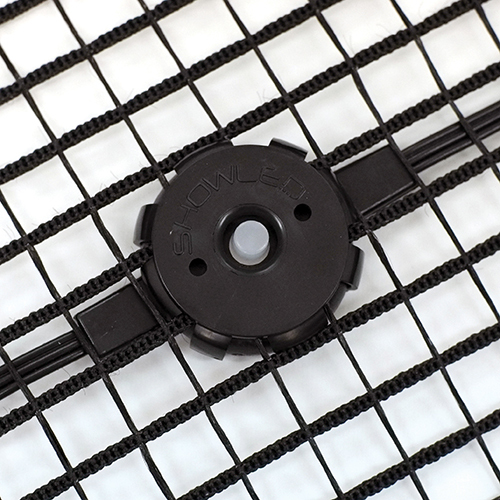 IFR black polyester netting. Water and UV resistant. 10x10mm mesh. 4 x 9m, and 3 x 12m with 30 LEDs per sqm (randomly placed). Other sizes, shapes or LED densities on request.